Situated in a security village in a tranquil suburb, Aandbloem Guest House is surprisingly close to all major routes and business centres, only a few minutes away from the Centurion Business Centre, and within easy reach of the Johannesburg International Airport. Guests can relax next to the sparkling swimming pool on the premises, with sundowners from our fully licensed bar, whilst listening to the large variety of birds nesting in the indigenous trees in the evergreen garden. The famous Swartkop Country Club and a Fitness Club are close-by. 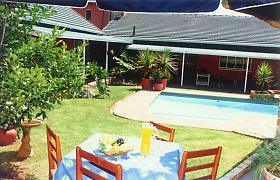 The Aandbloem Guest House accommodation consists of 10 luxury en-suite rooms. All rooms are equipped with TV and M-Net, a telephone, tea and coffee making facilities, toiletries, ventilation fans and heaters. -Secure under-cover parking is available at no extra charge. 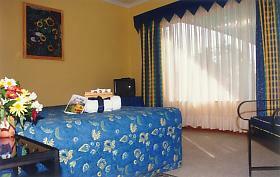 -Laundry and transfer services are provided. -A full English breakfast is served. Lunch and dinners are served on request. The conference room is fully equipped with audio-visual aids and has a large fireplace as well as a cooling fan. This venue is very popular for business seminars, and those who prefer total privacy and quality service. Fees include tea & coffee on arrival, mid morning tea & coffee and a snack, fruit juice, mineral water and sweets, a tastefully prepared two course lunch, and tea & coffee in the afternoon.